I totally dropped the ball on this one, but yesterday was the start of the week-long World Wide Knit in Public event. Yesterday was also when Victoria knitters decided to do their Knit in Public Day. I couldn't go due to the fact that I have a toddler that can't sit still long enough when outside for me to get a few stitches in, let alone a few minutes of knitting done. Oh well, I'm not sad about it cause I'm always knitting in public anyways. Seriously. If I'm in a line up at the grocery store, I'll whip my knitting out. If I'm at the doctors/dentist/anywhere that involves a waiting room, I'll pass the time knitting. 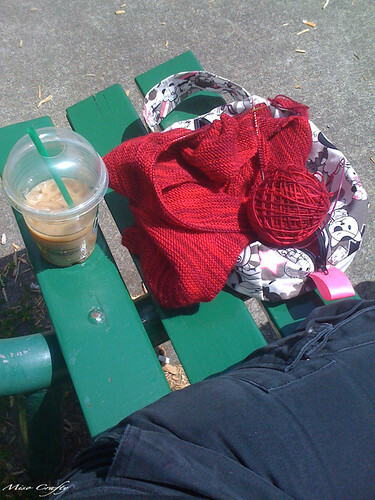 If I meet up with a friend for coffee, I'll be knitting while sippin' and chattin' (with permission, of course. Some people might feel like my knitting will mean I'm not paying attention to what they're saying). If the Munchkin falls asleep in the stroller while out and about, yeah I'll take a moment to sit on a bench for a few minutes to knit a few rows. But to honour WWKIP I decided to take a moment earlier this afternoon to go to the park (which was completely deserted), enjoy some rays while knitting on a quite bench for an hour. It was quite a lovely time. I can't remember the last time I had such a quiet and peaceful moment. I'm thinking I need to do this more often! So who else is partaking in WWKIP?